Lounge on the beach with a good book or cool off in the water while swimming, boating, water skiing, or fishing. Whatever your choice, we’ve got you covered! 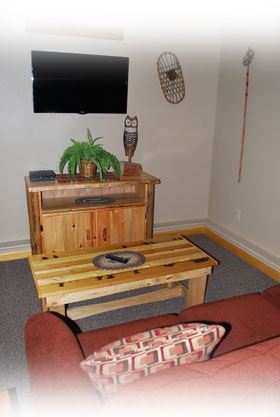 On rainy days or cool evenings, enjoy a good game with friends or just relax by the stone fireplace in the WatersEdge Cottages recreation room decorated in the Adirondack style. It’s equipped with card tables, board games, cable TV and comfortable seating. Get out and have fun with hiking trails, great fishing, tennis courts and golf – right in the immediate area! During the fall when the leaves change, the Adirondack Mountains explode with color and crispness. Simply enjoy the quietness in the clean, fresh air. Shopping and dining options abound at the many family-owned restaurants and shops in town. Three local establishments offer boat rentals by the day or week for your water enjoyment. You may tie your boat to our dock or secure it to a mooring in the lake close to shore. 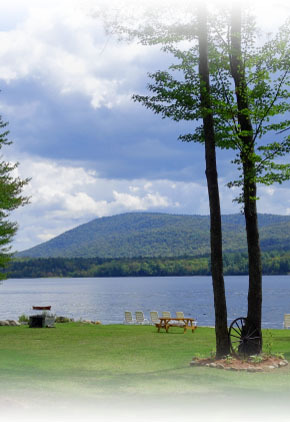 The town of Speculator holds many public activities such as summer concerts at the town pavilion, farmers markets, the popular 4th of July parade and fireworks, swimming lessons for children during specific weeks, nature trails, craft shows, lectures by local residents at the library, and more. See the town website for a list of seasonal activities. Within a five minute drive are restaurants ranging from fine dining to pubs to casual dining and pizza shops. A fully stocked food market is right in town, as well. Four charcoal grills located throughout WatersEdge grounds are provided for guests’ outdoor cooking enjoyment. Enjoy the local area by walking in the clean air while watching local wildlife. Hike up Hamilton Mountain, Panther, Snowy or Pillsbury Mountains and enjoy the beautiful views. You are surrounded by the largest state park in the United States waiting for you to explore its many vistas. Approximately one mile west of WatersEdge is the Lake Pleasant Golf Course – a well maintained, 9-hole challenging golf course with very reasonable rates. The spring and fall months are beautiful in the Adirondacks. Warmer days and cooler nights provide excellent recreation and sleeping. The summer months are free from the hustle and bustle of urban and city life and offer relaxing and eventful activities based upon your individual choices. Stay indoors and get cozy by the fire on cool days, where you can play games, read or watch TV. The rec. room allows you to spread out and relax indoors.